This page is imported from Wikipedia in order to test compatibilities (Creative Commons Attribution-ShareAlike). Source : Nile Delta from Wikipedia, The Free Encyclopedia. (auteurs ). The Nile Delta (دلتا النيل) is the delta formed in Northern Egypt (Lower Egypt) where the Nile River spreads out and drains into the Mediterranean Sea. It is one of the world's largest river deltas—from Alexandria in the west to Port Said in the east, it covers some 240 km of Mediterranean coastline—and is a rich agricultural region. From north to south the delta is approximately 160 km in length. The Delta begins slightly down-river from Cairo. From north to south the delta is approximately 160 km in length. From west to east it covers some 240 km of coastline. 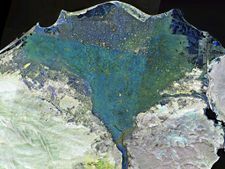 The delta is sometimes divided into West and East sections, with the Nile dividing into two main distributaries, the Damietta and the Rosetta, flowing into the Mediterranean at port cities with the same name. In the past, the delta had several distributaries, but these have been lost due to flood control, silting and changing relief. One such defunct distributary is Wadi Tumilat. The Suez Canal runs to the east of the delta, entering the coastal Lake Manzala in the north-east of the delta. To the north-west are three other coastal lakes or lagoons: Lake Burullus, Lake Idku and Lake Maryut. 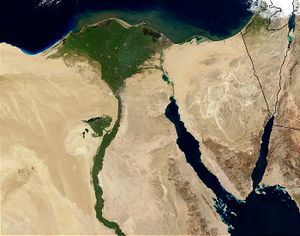 The Nile is considered to be an "arcuate" delta (arc-shaped), as it resembles a triangle or lotus flower when seen from above. The outer edges of the delta are eroding, and some coastal lagoons have seen increasing salinity levels as their connection to the Mediterranean Sea increases. Since the delta no longer receives an annual supply of nutrients and sediments from upstream due to the construction of the Aswan High Dam, the soils of the floodplains have become poorer, and large amounts of fertilizers are now used. Topsoil in the delta can be as much as 70 feet in depth. People have lived in the Nile Delta region for thousands of years, and it has been intensively farmed for at least five thousand years. The Nile River used to flood on an annual basis, but this ended with the construction of the Aswan Dam. Records from ancient times (Pliny the Elder) show that the delta had seven distributaries: (from east to west) the Pelusiac, the Tanitic, the Mendesian, the Phatnitic (or Phatmetic), the Sebennytic, the Bolbitine, and the Canopic (also called the Herakleotic, e.g. at [Callisthenes] Alexander 1.31). 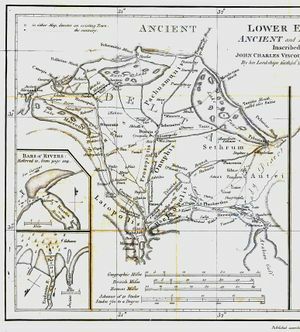 There are now only two main branches, due to flood control, silting and changing relief: The Damietta (corresponding to the Phatnitic) to the east and the Rosetta (corresponding to the Bolbitine) on the western part of the delta. The Rosetta Stone was found in the Nile Delta in 1799 in the port city of Rosetta (anglicized name of Rashid). In pharaonic times, the delta was known as Lower Egypt. It was also called the "Land of Goshen". There are many archaeological sites in and around the Nile Delta. About half of Egypt’s 80 million people live in the Nile Delta region. Outside of major cities, population density in the delta averages 1,000 persons/km² or more. Alexandria is the largest city in the delta with an estimated population of more than 4 million. Other large cities in the delta include Shubra al Khaymah, Port Said, El-Mahalla El-Kubra, El Mansura, Tanta, and Zagazig. During the fall, parts of the Nile River are red with lotus flowers. The Lower Nile (North) and the Upper Nile (South) have plants that grow in abundance. The Lower Nile plant is the Egyptian lotus, and the Upper Nile plant is the Cyperus papyrus (papyrus sedge), although it is not nearly as plentiful as it once was, and is becoming quite rare. 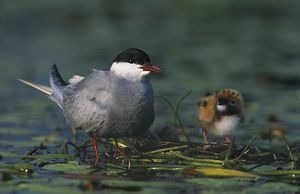 Several hundred thousand water birds winter in the delta, including the world’s largest concentrations of little gulls and whiskered terns. Other birds making their homes in the delta include grey herons, Kentish Plovers, shovelers and cormorants. Also found are egrets and ibises. Other animals found in the delta include frogs, turtles, tortoises, mongooses, and the Nile monitor. Nile crocodiles and hippopotamus, two animals which were widespread in the delta during antiquity are no longer found there. Fish found in the delta include the Striped mullet and soles. The Nile Delta has a Mediterranean climate, characterized by little rainfall. Only 100 to 200 mm of rain falls on the delta area during an average year, and most of this falls in the winter months. The delta experiences its hottest temperatures in July and August, averaging 30°C, with a maximum of around 48°C. Winter temperatures are normally in the range of 10° to 19°C. With cooler temperatures and some rain, the Nile Delta region becomes quite humid during the winter months.